Fifty years ago you could buy a house straight out of college. The job market was lush with opportunities for young, hardworking employees with a freshly minted degree from "Such and Such" University. Nowadays, it seems that there are no graduation guarantees. Having a four year degree no longer equals having a high-paying job in a secure field. "Why is that, and what does it mean for students getting ready to take those first few steps into the real world this May?" you ask. Let College Magazine lay it out for you. 70% more college grads are working minimum wage jobs than a decade ago. The issue of minimum wage has been a point of critical debate in the U.S. for over a century with the first minimum wage law being ratified in Massachusetts in 1912. 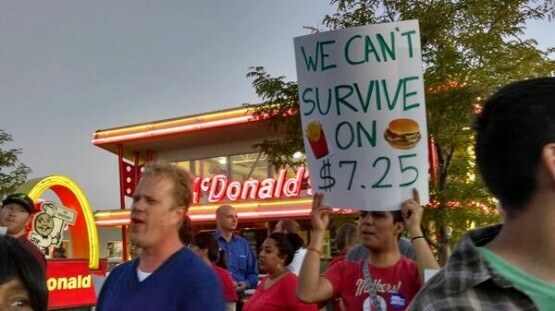 Since then, the minimum wage average continues to be a source of contention and recently there has been an increasing number of rallies calling for a pay hike for minimum wage workers. Ali Krantzler of Guilfordian.com writes, “A gallon of milk costs $4.59. A gallon of gas costs $3.75. A loaf of bread costs $5.00, but the federal minimum wage rate stands at $7.25. How are college graduates supposed to support themselves with such low pay?” As the cost of living continues to rise, many people around the country struggle to make ends meet. Among these folk are college grads who are increasingly joining the number of people trying eke out a living on meager wages. Throw in student loan debt and the problem gets even deeper. From New York to Washington, D.C. to California, people are standing up to businesses like Wal-Mart, McDonald’s, and K.F.C. and demanding more for their hard work. It’s easy to see why this is such a hot button issue, but are the protests really making a difference? Let’s take look at the pros and cons. Yet, as with all controversial issues there are valid points against it. For one thing, many mom and pop stores and smaller chain stores, argue that if they paid their workers higher wages, the price of their products would need to be raised to cover the costs. Grocery stores like Giant Food Corp. state that they would be forced to hire fewer employees and start using more automation (things like self-checkout counters which eliminates the need for live cashiers) or doubling the workload for current employees. For example, Chili’s restaurants abstained from hiring busboys and opted to have the servers also bus tables, saving them $25 million. 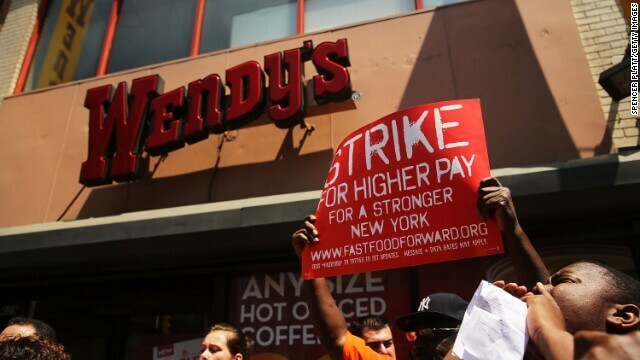 Raising minimum wage would also increase the competition for low-paying jobs. Many young college students would be taking jobs away from lower-income families with un-educated caregivers. Statistically speaking, the unemployment rate of college graduates is only half of that of those with a high school diploma or less. Though half of new grads are working jobs that do not require a degree, the recession is on decline and the future is still looking bright. Which means, whether you get your dream job in May or not, there's still hope. That's what the minimum wage strikes are about – giving people a chance to fight for a better future for everyone, one in which you don't have to worry about finding a way to make ends meet once your meal plan runs dry next year. That's certainly something worth fighting for.